Although the annual number of fatalities in road transport in Slovenia has been declining for decades and has almost halved in the last 20 years, traffic accidents over the last decade took more than 190 lives a year, on average. The number of deaths in road accidents has been declining over the last decade. This positive trend is also seen in most other European countries. This indicator defines the number of road traffic accidents, fatalities and injuries in the period 1991–2007 in Slovenia as well as changes in the number of road traffic accidents, fatalities and injuries in EU countries in the period 1991–2014. The number of accidents, fatalities and injuries in rail transport in Slovenia in the period 2004–2015 is also presented. The traffic accidents that are included are those within a given year resulting in death or injury and that were attended by or reported to the Police within 24 hours of the event. Included collisions were those between road vehicles, between road vehicles and pedestrians, between road vehicles and animals, between fixed obstacles and one road vehicle alone, and between road and rail vehicles. Multi-vehicle collisions are counted as only one accident provided that any successive collisions happened at very short intervals after the main collision (Statistical Office of the Republic of Slovenia, 2015). Fatalities are included as all persons killed outright or within 30 days as a result of an accident. Injured persons are all those who were not killed, but injured in an accident and who needed medical treatment (CARE, 2011). Seriously injured persons are all those who were involved in a road traffic accident and sustained injuries that put their life in danger or damaged their health (either extremely, temporarily, or to a lesser extent, permanently) or meant that they were temporarily unable to perform any work or that their ability to work was permanently diminished (Penal Code of the Republic of Slovenia; Statistical Office of the Republic of Slovenia, 2015). A rail traffic accident includes any accident involving at least one moving rail vehicle and resulting in at least one serious injury or death. Road safety evolution in EU. CARE – European Road Accident Database, European Commission, 2016. To increase safety of rail transport through larger investments into the technical protection of traffic, maintenance of infrastructure and vehicles, modernisation of vehicles and harmonisation of Slovenian and European transport systems, elimination of level crossings for pedestrians and road-rail level crossings and an increased number of non-level crossings, providing information to all users and education for all rail transport participants. To halve the number of road deaths by 2020 (compared to 2010 as a base year). 2050 vision: zero fatalities in road transport, which is to be accomplished through improved education and training of participants in road transport and implementation of road traffic regulations, provision of safer road infrastructure and safer vehicles, promotion of the use of technologies that improve road traffic safety and protection of vulnerable road users. White Paper goals are included in the National Road Safety Programme for the period 2012–2021 (NPVCP, 2011). The programme goals include preserving lives in road transport, halving the number of persons killed or seriously injured, limiting fatalities on Slovenian roads to 70 per year (35 per million inhabitants) and limiting persons seriously injured to 420 per year (210 persons per million inhabitants) by the end of 2021.
a 40% reduction in the number of people suffering critical injuries in road accidents. Strategic goals of the Resolution on the National Road Safety Programme for the Period 2013–2022 (ReNPVCP13-22, 2013) include (in addition to the common goal of the EU Member States to preserve lives and to halve the number of persons killed or seriously injured) limiting fatalities on Slovenian roads to 70 per year (35 per million inhabitants) and persons seriously injured to 460 per year (230 persons per million inhabitants) by the end of 2022. Despite improvements, especially in the recent decade, the level of traffic safety remains unacceptably low, which reduces the quality of life in our society. The state of road traffic is of particular concern, as the number of fatalities on EU roads remains high and injuries in traffic accidents are the main cause of health problems for the population up to 44 years of age. Also, the consequences of traffic accidents are connected with high social costs: in 2010, they amounted to approximately EUR 130 billion in the EU (based on the statistical value of life calculated in the HEATCO study carried out within the 6th Framework Programme for Research and Technological Development). In 2011, the estimated social costs of traffic accidents in Slovenia amounted to EUR 636 million, which represented 1.76% of the GDP. Therefore, road safety is an important social issue in the EU as well as in Slovenia. In 1995, 137 road traffic participants per million inhabitants were killed in traffic accidents in EU countries. In Slovenia, 415 road accident fatalities were recorded in the same year, with which Slovenia exceeded the EU average by more than three times. According to this criterion, Slovenia was among the least safe European countries in 1995. In 2009, Slovenia had 84 road traffic fatalities per million inhabitants, which was still 20% above the EU average (69 fatalities per million inhabitants). In 2011, 30,100 persons were killed in road accidents in the EU, which corresponds to the population of a mid-sized city, while 324,000 persons were seriously injured. In the same year, there were 141 fatalities and 919 persons seriously injured in road accidents in Slovenia. Since 2001, the development of traffic safety in the EU has been showing a decreasing trend in the number of road accident fatalities. In 2001, the EU set a target to halve the number of road accident fatalities (54,000 were recorded in that year) by 2010. The number was reduced by 43% (to 31,000 fatalities), which was a relatively positive result, although the target was not entirely met. In 2011, the number of road accident fatalities per million inhabitants in Slovenia (69) approached the EU average of 60 fatalities per million inhabitants (ReNPVCP13-22, 2013). In the recent decade (especially from 2007 onwards), the number of fatalities on our roads has been gradually decreasing. In 2010, the number of traffic accident fatalities on Slovenian roads was 138, in 2012 130, in 2013 125 and in 2014 108. The number of seriously injured persons in traffic accidents in Slovenia peaked at the beginning of the 1970s and gradually decreased to less than 10,000 in 2010 and 2011 (ReNPVCP13-22, 2013). In recent years, the number of persons seriously injured in traffic accidents has been fluctuating (2,660 in 1991, 865 in 2010, 919 in 2011, 848 in 2012, 708 in 2013 and 826 in 2014). The number of road traffic accidents resulting in fatalities or serious injuries increased rapidly between 1991 and 2014, when it started decreasing. The number of such accidents in the selected years was as follows: 5,479 in 1991, 12,721 in 2004, 11,414 in 2007, 8,589 in 2009, 7,218 in 2011, 6,542 in 2013 and 6,264 in 2014. The number of traffic accident fatalities in 2014 compared to the base year of 1991 decreased by more than half in most European countries (except in Bulgaria, the Czech Republic, Malta and Romania). The highest decrease in the number of fatalities was recorded in Estonia (84%), Spain (81%) and Portugal (80%). 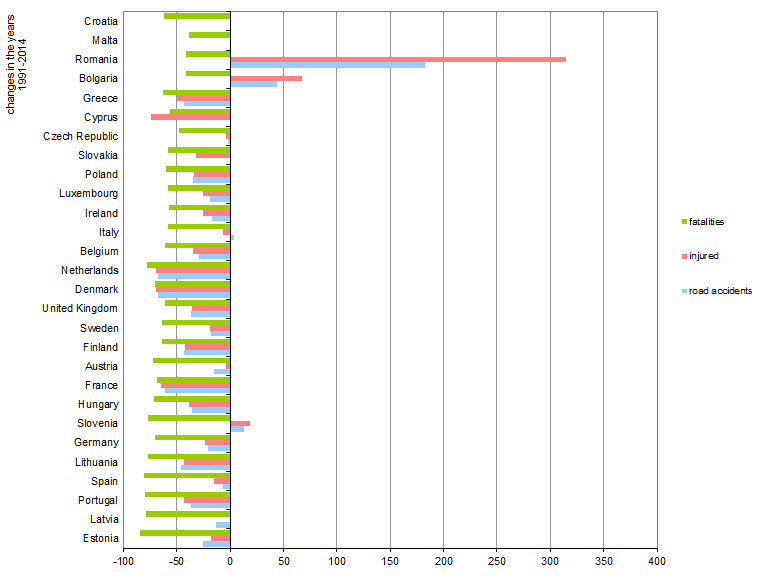 The lowest decrease was recorded in Malta (38%), Bulgaria and Romania (41%), the Czech Republic (48%) and Cyprus (56%). With 108 road traffic accident fatalities in 2014, which represented a 77% decrease compared to 1991, Slovenia was ranked 6th among the EU-28 countries. The number of persons injured in road traffic accidents decreased in most EU countries in the period 1991–2014 except in Bulgaria, Latvia, Romania and Slovenia. The highest decrease was recorded in Cyprus (74%), Denmark and the Netherlands (69%), France (65%) and Greece (50%), while the number increased in Romania (by 315%), Bulgaria (67%), Slovenia (19%) and Latvia (1%). In 2014, Slovenia was ranked 24th with regard to reduction in the number of persons injured in traffic accidents. In the period 1991–2014, the number of accidents resulting in fatalities or persons injured decreased as well. In most countries, the number decreased, except in Bulgaria, Italy, Slovenia and Romania. The highest decrease was recorded in Denmark and the Netherlands (67%), France (61%) and Lithuania (46%), while an increase was recorded in Slovenia (13%), Italy (4%), Bulgaria (44%) and Romania (183%). Among 24 European countries, Slovenia was ranked second last as regards the decrease in the number of road traffic accidents in the period 1991–2014. In railway traffic in Slovenia, the number of fatalities at rail line level crossings for pedestrians has been fluctuating over the last decade. In the period 2004–2015, there were 368 railway accidents resulting in 95 fatalities and 217 persons seriously injured. In general, the number of railway traffic accidents tends to fluctuate from year to year as traffic accidents at level crossings are specific. 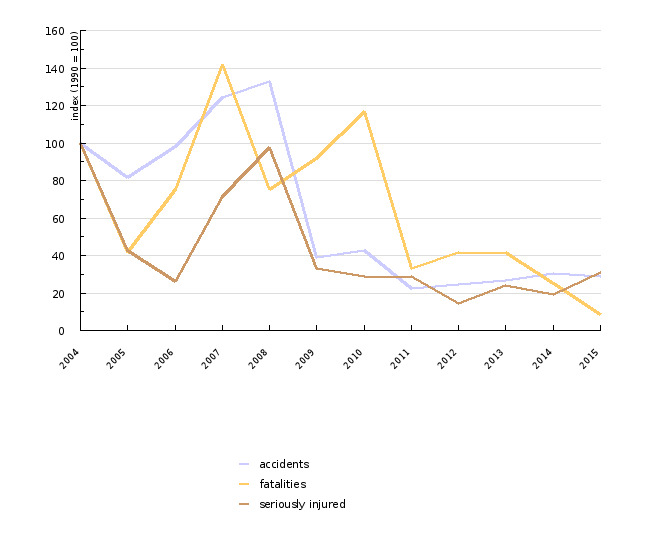 A distinct decrease was recorded in 2008 and 2009 (65 and 12 accidents, respectively). A slight increase was recorded in the period 2011–2014 (from 11 accidents in 2011 to 15 in 2014). 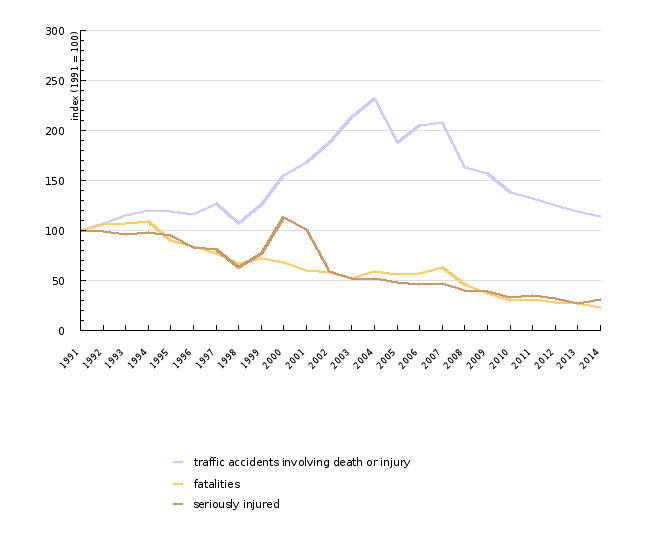 Nevertheless, the number of fatalities has decreased in recent years. In 2012 and 2013 each, 5 persons were killed in railway traffic accidents, 3 fatalities were recorded in 2014 and only one in 2015. The number of persons seriously injured in railway traffic accidents has been fluctuating as well. Six persons were seriously injured in 2012, 10 in 2013, 8 in 2014 and 13 in 2015. Despite the decrease in the number of road accident fatalities, the number of persons injured and related social costs have been increasing in Slovenia. Since 1995, the annual number of traffic accidents and persons injured in those accidents has increased by 108% and 149%, respectively. The causes vary, from above-average motorisation and the growth of motorised road transport to the abandonment of safer modes of transport (public passenger transport in particular). According to the EEA, such trends (less fatalities and more traffic accidents and injuries) in the new EU Member States (EEA, 2005) can be contributed to improved technologies and higher safety standards in new vehicles, improved quality of roads and road signalisation, amended legislation in the field of driving under the influence of alcohol and stricter imposition and enforcement of speed limits. Meeting the above-stated goals and targets will require a harmonised integral approach in which synergies of transport policies are pursued, while in the field of road safety, consistent implementation and strict enforcement of road safety regulations at all levels (from local to European and international) will be required.